Decorate a Butterfly. 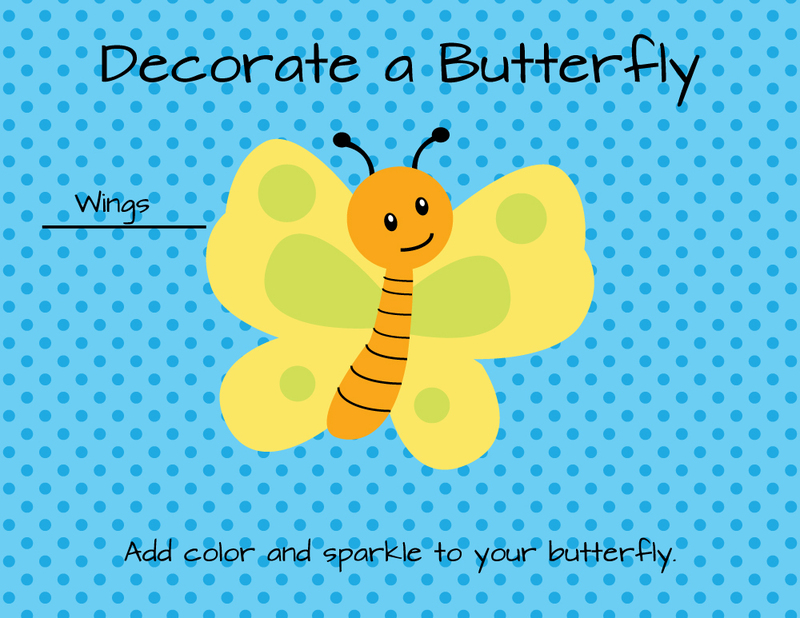 This is a process based lesson that will result in a finished product of a butterfly. This lesson was part of the Butterfly Theme Art Lesson Playdate. Modify for older children by having them trace the butterfly and then cut along the tracing. Modify for older children by introducing symmetry. Tissue Paper, cut into small squares, but not too small a toddler can’t hold it. Sequins & Spangles, like these Chenille Kraft Company Sequins & Spangles 4 Oz. Fold the tag board in half and cut out a butterfly shape. Attach the contact paper to the tag board. Add tissue paper, and sequins to butterfly to give the wings color and sparkle. When finished hang in a window! Fine motor coordination by picking up small items like the sequins and separating the tissue paper out from the pile. Decision making on what colors and sequins to use. I am big on using “real”vocabulary and using it often knowing that lots of repeating will eventually allow the concept and vocabulary to take hold. While he works and makes choices on what to add to his picture I will use the vocabulary. When we observe the final picture in the window and marvel at our creation, I will use the vocabulary. If the sequins are decorative and come in shapes like circles, and stars, use the vocabulary or have them use the vocabulary for the items they are choosing. Transparent: Lets light all the way though. Can see all the way through. The Contact paper is transparent. Opaque: Doesn’t let light through. You can not see through. The Tagboard and the sequins are opaque. Translucent: Only lets some light through. The tissue paper is translucent.